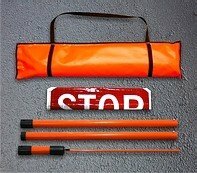 This Dicke Safety Product is a Roll-Up Stop/Slow Paddle, model NR183A. Non-Reflective, 18" NR w/3-Pc. 6 FT Org Staff & Case. Roll-Up stop/slow paddles offer full size paddles in a compact, lightweight, and easy to store design. Available in 18" and 24" octagons and in a variety of reflective and non-reflective materials, these kits come complete with double sided roll-up sign face, handle, and storage bag. If you have any questions about this product by Dicke Safety Products, contact us by completing and submitting the form below. If you are looking for a specif part number, please include it with your message.